Ray Posada is a teacher at Stoneman Douglas High School speaks during a convocation at Belmont University Nashville, Tennessee, March 22, 2018. Ray Posada, a 2013 Belmont alumnus and teacher at Marjory Stoneman Douglas High School (MSD), visited Belmont’s campus this week to share his experiences and insights with students. 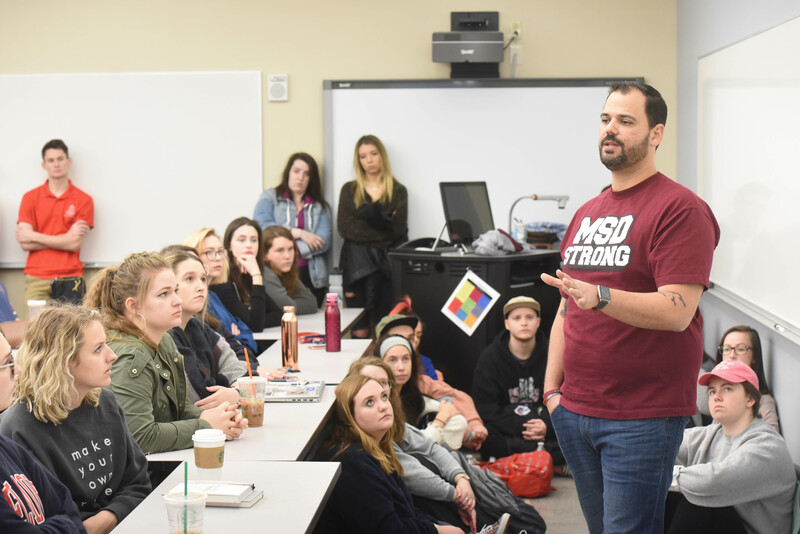 Initially planning to encourage education majors with a message about remaining in their chosen career path, Posada found himself sharing his story with students from across campus, reminding them to support teachers across the company in their classroom endeavors. When the door to the copy room was opened by an armed SWAT team and Posada was able to leave the building, he walked nearly a mile to the staging area where he found his wife. Immediately, Posada said he began wondering whether he should go back to the classroom given the threat he was feeling. “I didn’t get into teaching to be shot at,” he said. “I didn’t get into teaching so that I could come back to the class and see an empty desk.” But after attending MSD’s vigil the next day and seeing one of his students, he realized he didn’t have a choice.